Turn on the Instant Pot and select the Sauté program. If necessary, press the Sauté key repeatedly to toggle to the Normal setting. Wait until the LED displays “Hot”. Stir the bacon and onions into the oil and cook for about 5 minutes, stirring often, until the bacon is cooked and the onions have begun to turn clear. Press the Sauté key repeatedly to toggle to the More setting. Being careful not to burn the onions, cook until meat has browned, about 5 minutes. Stir often. Press the Sauté key repeatedly to toggle to the Less setting. Stir all ingredients together until evenly mixed. Press Cancel on the cooker. Place the lid and turn to lock. Turn the steam release handle to the Sealing position. Select Pressure Cook, High Pressure, and set for 30 minutes. 10 seconds after settings are set, the cooker will beep three times and display “On” to indicate that it has started the preheat cycle. When the cooking cycle has finished, the cooker will beep and enter the Auto Keep Warm mode. (If the Auto Keep Warm function has been turned off, it can be turned back on at any time.) Once the cooking is complete, allow the pressure to release naturally for 10 minutes, and then turn the steam release handle to the Venting position to let the steam out for a Quick Release. Once the steam is safely released, remove the lid. Turn the cooker back on to Sauté > Normal and simmer stew until it has thickened somewhat, about 15 minutes. 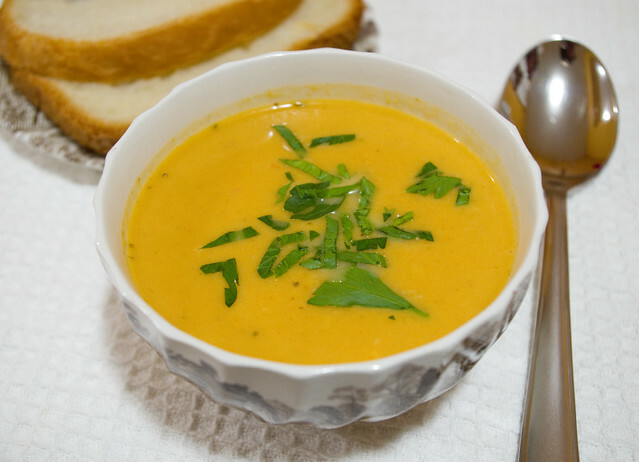 While thickening, stir regularly, and remove the sprigs of thyme, if using fresh. Serve stew in soup bowls, either as-is or atop a mound of mashed potatoes with a divot in the middle to hold the toppings. *I find that bacon is easiest to cut up using kitchen shears. 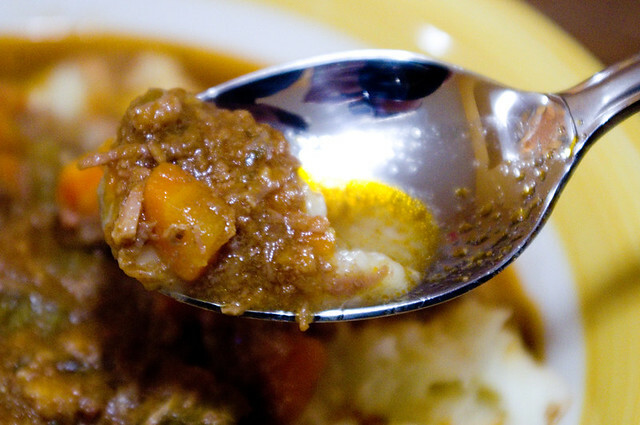 **Most kinds of beef are good in stew, so use whatever is in your budget. The pressure cooking (or slow cooking, in traditional stews) will transform even the toughest cuts into something you can cut with a fork. Whatever the cut, make sure to cut off the worst of the fat, since the texture can become off-putting. 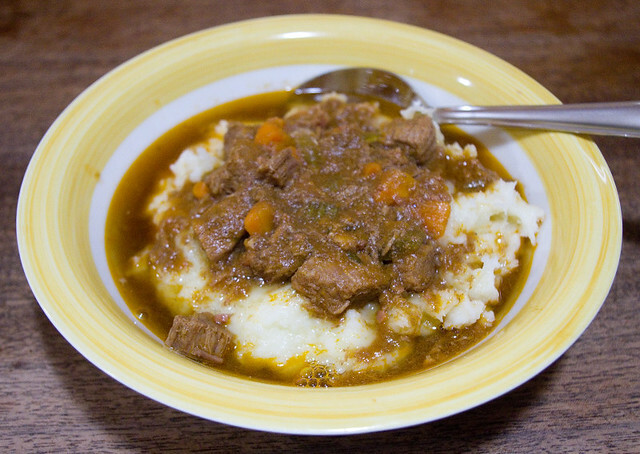 ***I prefer this stew served over mashed potatoes to soak up all of the lovely broth, but many people like it plain. Barley Malt Syrup: a thick syrup that greatly resembles molasses in appearance, which is extracted from sprouted (malted) barley. (Pictured above.) In Canada, this can be found in specialty or high end food stores like Whole Foods. In England, I’m told that it’s as common as molasses is here, and that children will often sneak spoonfuls of the stuff from the pantry. Malt Extract Powder: An ingredient often used in home brewing, malt extract powder can be derived from sprouted (malted) barley or wheat. (Light dried wheat malt extract pictured.) This can be procured quite cheaply from home brewery supply stores and brew-your-own small breweries. While all of these are all derived, at least in part, from the same process, they are all distinct ingredients in their own right and it will greatly change the outcome of a recipe if you use the wrong one. The problem is that a number of recipes I’ve come across (and ingredient lists on packaging, for that matter) sometimes use the blanket term “malt” for any of the three. This becomes increasingly concerning in the case of allergies/food intolerances or trying to eat strictly vegetarian/vegan. So I learned all of this but still wasn’t able to find a local source for barley malt syrup. Not long later (but after I’d pretty much given up), a friend of mine came across some at a specialty grocery store and picked it up for me. Sadly, I had moved on to non-malt-based recipes by then, and the malt sat in my fridge for quite some time. Skip ahead to last week, when I cleaned out my fridge and realized that my malt was still there — and still good! (I believe it’s like maple syrup in that it’ll last years under ideal conditions.) 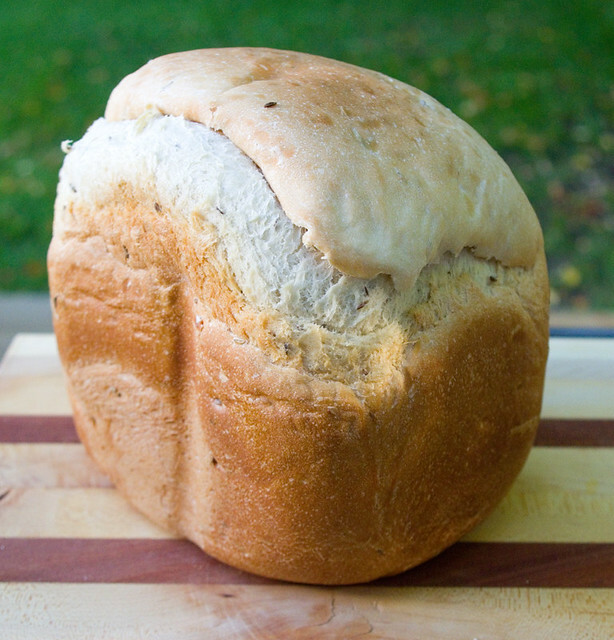 I put together a bread machine recipe and tested it out a few times, to my family’s happiness. The malt creates a slightly darker loaf and adds a hint of sweetness (but not so much so it’d be called a truly sweet bread). Side note: This bread can be made vegan, if you use a vegan margarine instead of butter, and use the correct style of malt, which is the barley malt syrup kind, in this case. Set the bread machine to the basic/normal/white setting, with a light or medium crust to your preference. Press start. Running this cycle should take about three to four hours, depending on your machine. I think I’ve finally gotten the beer bread recipe to the point that I feel it’s good enough to share! 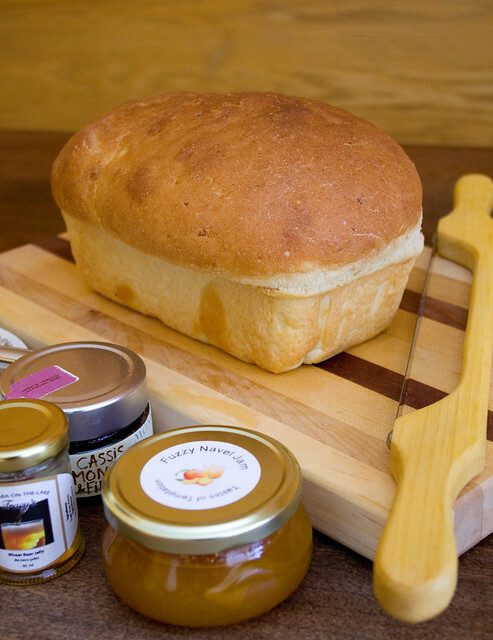 This bread is customizable based on what kind of beer you choose to use. For this bread I chose to use Lost Craft’s India Pale Ale, which is a nice, light beer with only a 4% alcohol content. But feel free to choose the beer that you like best! A stout will make a much darker, richer bread, while a crisp, light beer will have a much less pronounced taste. You could even use a non-alcoholic beer. Additionally, you can choose to omit the caraway seeds, which do have a strong flavour of their own, so that the beer shines through. The beer that you choose to use changes what it goes well with. It’s a light fluffy bread no matter the beer, so if you’re going to spread something on top, it’s best to toast it first. With a light ale and caraway seeds, I like it paired with a sharp cheese, deli meats, and/or a touch of mustard. Without the caraway, I have served it with eggs and toast for breakfast, and received quite a few compliments. Four potatoes mashed fine, four teaspoons of salt, two quarts of lukewarm milk, one-half cake compressed yeast dissolved in one-half cup of warm water, flour enough to make a pliable dough ; mould with hands well greased with lard ; place in pans, and when sufficiently light, it is ready for baking. You’ll notice that it gives no cooking time or temperature, no approximate yield, no idea the volume of mashed potatoes, how big a cake of yeast measures (and what kind of yeast — the book gives multiple recipes for how to make your own), or how much flour to use. I’m really glad this wasn’t the first loaf of bread I’d ever made! Although I guess part of the point of these recipes is that they assume that all readers will have a certain breadth of knowledge base. As it turns out, this recipe makes 4-5 loaves, depending on the size of your loaf pan. I honestly didn’t even have a bowl big enough to mix all of the ingredients, so I had to stir everything in shifts. It all turned out quite well, though, so I thought I’d share my interpretation of the recipe. Hopefully it’s a little more easily-repeatable than the original; I’ve also halved the quantities in my version for ease of cooking in a modern kitchen. The end result is a white bread that is still a little heavier and more filling, due to the potatoes. It also stays moist much longer than a straight white loaf. Wait for yeast to activate; if it foams up, it is good to use. Peeled, this should yield about 265g of uncooked potato. Place potatoes in a stove-safe pot, cover with water, and bring to a boil. Reduce heat to a simmer and cook until the potatoes are easily pierced with a fork. Alternately, you can cook the potatoes in a microwave-safe casserole: place potatoes in the dish, cover with water, and cook on high until they can be easily pierced by a fork, about 12 minutes. No matter how you prepare the potatoes, drain them once cooked and mash them until they are no longer lumpy. Set aside to cool somewhat. Stir. Add the yeast mixture and the potatoes to the mixture, stir well. As the end of adding the flour nears, the mixture may become too stiff to stir with a spoon. If it does, it can be stirred with floured hands in the bowl. Flour a flat surface and hands generously. Turn the dough out of the bowl, scraping if necessary. Knead the bread for about 10 minutes, until it is springy. If the dough is too sticky on the hands or flat surface, add a bit more flour, but add it gradually and only add as much as absolutely necessary. The dough should be moist but not sticky. Oil or use cooking spray on a large mixing bowl. Form the dough into a ball and place it in the bowl. Cover the bowl with a clean, damp tea towel. Place the bowl in a warm, dry area with no drafts. Allow the dough to rise until double, about 1 hour. Grease two loaf pans. 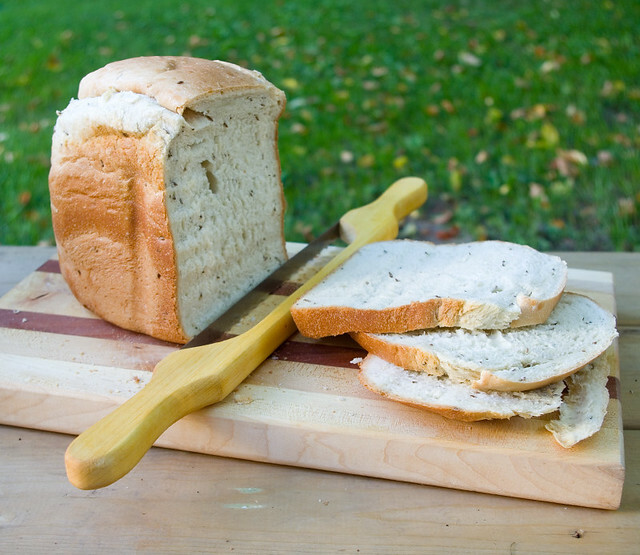 If you use smaller loaf pans (8.5″x4.5″), they will end up with a “mushroom top” loaf like the one pictured. If you use larger 9.5″x5.5″ pans, the bread will be a more uniform shape. Divide the dough into two even portions, form each into a loaf shape and put each one into its own loaf pan. Cover with a damp towel and allow to rise again in a warm, draft-free area until double, about one hour. Near the end of the rising time, preheat your oven to 350°F (175°F). Bake for about 30 minutes, checking often near the end of that time to make sure that they do not overcook. Verify that the bread is done by removing them from the pan and tapping them on the bottom. 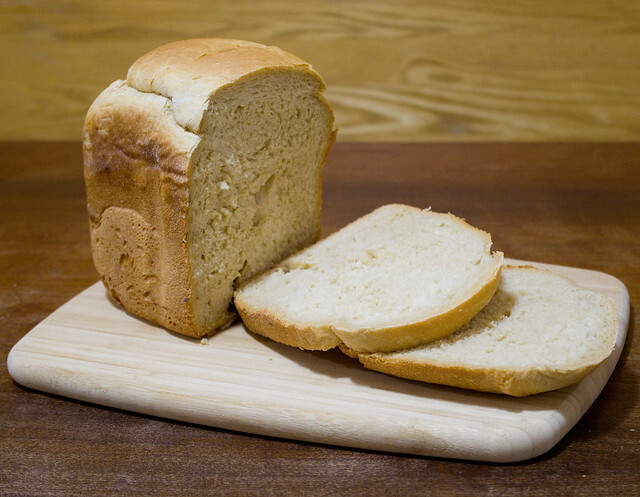 When cooked through, the loaf should make a hollow sound. Remove the loaves from the pans immediately and place them on a wire cooling rack. As with all bread, this kind is best served immediately. To keep it at its freshest, slice it only when it is about to be eaten. This bread will keep for four or five days if wrapped in a clean plastic bag. Make sure it is wrapped up only after totally cool, or it will go soggy. I’ve been making beef stroganoff for fifteen years or so, but I hadn’t had any since a consultation with a dietician who suggested that I may be lactose intolerant. It’s been about a year since I started avoiding lactose, and my gut is much happier for it. I’m not touting this as something that everyone should try, since I know that there are a whole lot of people that tolerate lactose just fine — but sadly, I’m no longer one of them. Lately I’ve been quite happy to discover that, in addition to the vegetarian/vegan options to milk that are out there, a few dairy companies have started to sell lactose-free versions of their products. I’ve found PC lactose-free old and marble cheddars in my local grocery store, and, for the first time just this week, Gay Lea’s lactose-free sour cream. As soon as I saw the sour cream on the shelf, I knew that I had to make some stroganoff this week. Now, I’m not vouching for the authenticity of my stroganoff or anything. I can’t even remember where I first learned how to make it; it certainly wasn’t from someone who taught me in person. My version is the combination of a number of recipes over the years that have created what I’d consider to be a good meal for when you have a little bit of time to cook, but you still have other plans for the evening. It’s full of mushrooms and onions, but I recommend serving it with steamed veggies or a side salad to round it out. At the very least, this will add a splash of colour, since stroganoff is such a beige dish! Traditionally stroganoff is made with broad egg noodles, but in our house we usually use penne. Rotini, fusilli, farfalle, and even elbow macaroni (pictured) also work well. Once the pasta is cooked, drain it and set it aside. Stir the sour cream and cheese in until they are evenly distributed and have created a sauce; the sauce will have picked up some of the browning and spice and will have turned a nice light brown. Add the drained pasta to the pan, and stir it all together until coated. Serve! *You can add more mushrooms (up to double as much if you like), but this is the amount that my family prefers. 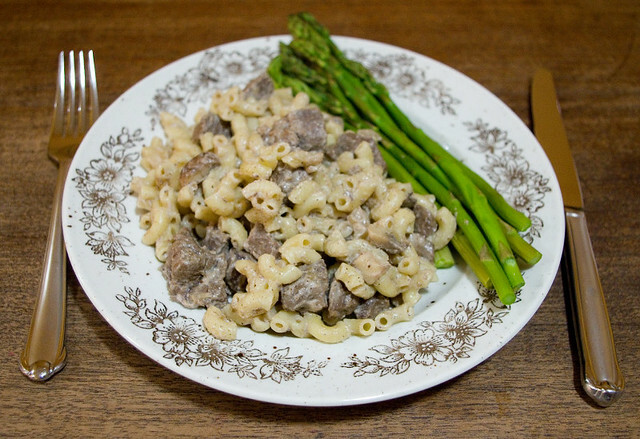 **I used to make my stroganoff with cream cheese every time, since I find it’s much creamier this way, but I have yet to find a lactose-free version. So for now I make it without. When I was doing the Dollar Store Challenge last week, I had the chance to get a good look at the non-junk-food ingredients that the store had to offer. I was inspired to try to make another meal from the ingredients, this time a to-go, prep-ahead breakfast or lunch. I was inspired by some of the pancake mix muffins I’d seen on the Internet, but of course I had to make some serious adaptations to adjust for what’s available at the Dollar Store. As a bonus, it’s also vegetarian (although not vegan), and can be made nut-free. When budgeting for this meal, keep in mind that there will be leftover pancake mix, coconut milk, and applesauce that can be used in additional recipes. After having made the muffins, next time I would probably add a spices for inexpensive added flavour and some chopped walnuts for crunch and weight. I didn’t see either of these ingredients at my local Dollar Store, so it wouldn’t strictly conform to the challenge, but you could easily stay under the $10-to-serve-four-people mandate by buying small quantities of both at the grocery store or Bulk Barn. Of course, if you’re allergic to nuts or you want to send the muffins to a nut-free environment like an elementary school, just skip them! I didn’t use spices in this batch, so if you follow the recipe, the colour of your final product will be slightly darker. Drain the syrup from the peaches into a measuring cup. 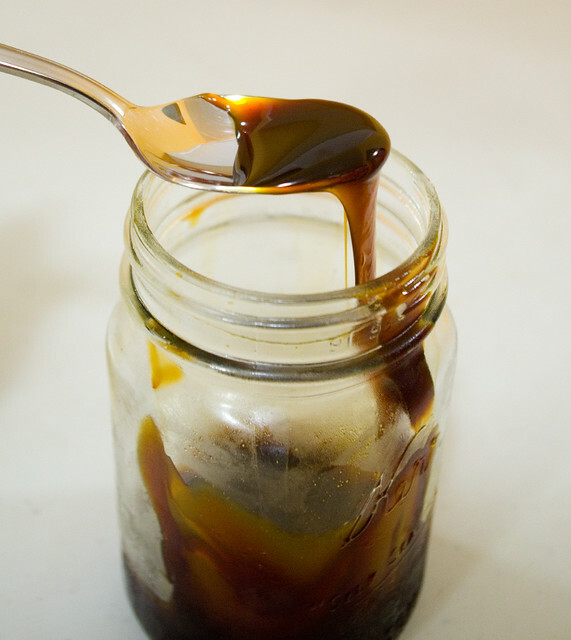 Top up the syrup with water until the combined liquid measures 1 cup. Add the liquid to the mixing bowl. Mix until batter is smooth. 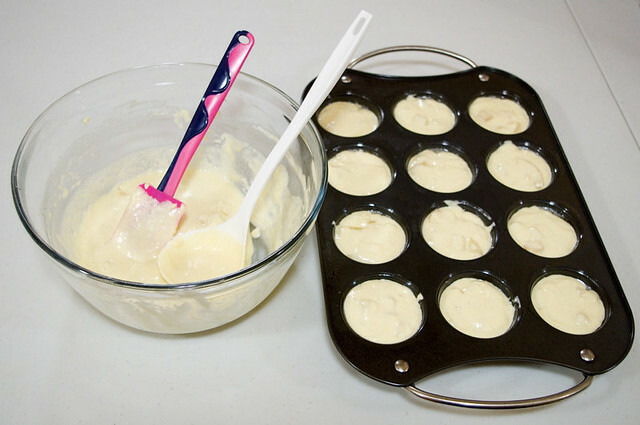 Grease a muffin pan or spray with baking spray. Ladle batter into cups about 2/3 full. 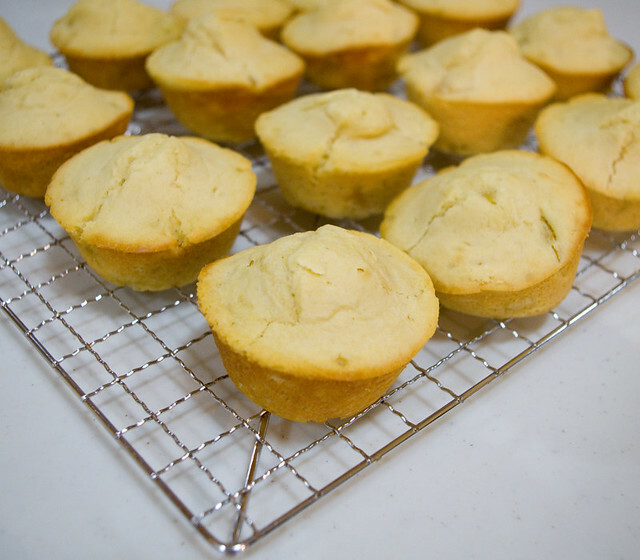 Bake for 14 to 16 minutes, or until a cake tester inserted into one of the muffins comes out clean. Turn them out of the pan immediately and place them right-side-up to cool on a wire rack. Muffins may be eaten right away or cooled completely and then stored in a sealed container at room temperature. 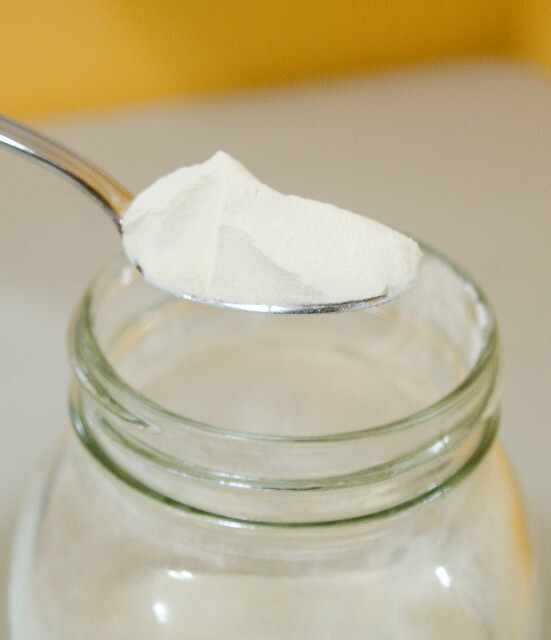 *Canned coconut milk tends to separate, so stir it well before measuring. 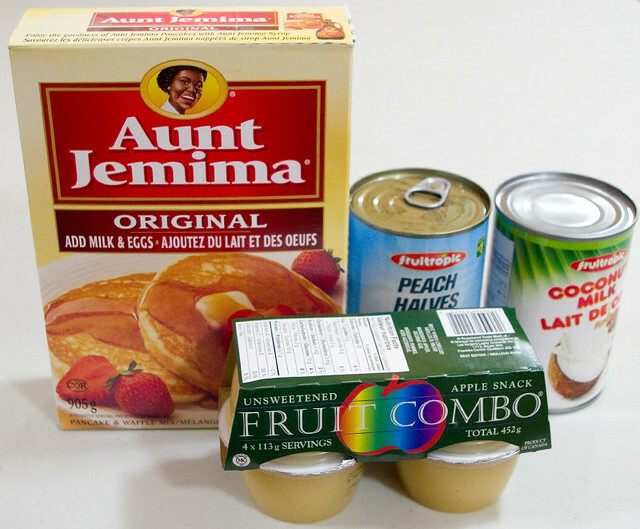 **Other types of canned fruit or fruit mixes may be substituted, so long as they are in a light syrup.